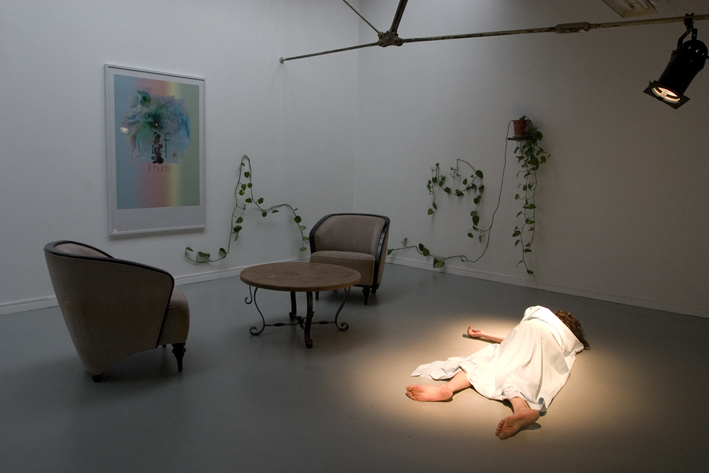 An installation / performance / poster that combines kitsch and a phenomenological concern for the perceived object. The image is an inverse allegory that produces an image to explain itself and thereby contradicting the supposed autonomy of a performance-as-metaphor: it is the embodiment of an idea, as it takes the form of a lifeless body. 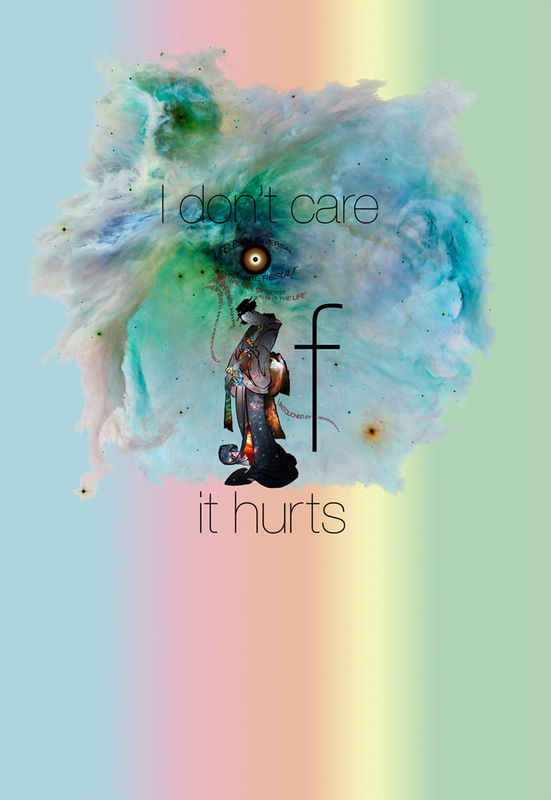 The quote that forms the centerpiece, “I don’t care if it hurts”, is appropriated from an early hit by Radiohead. The pun of the image lies in an ambivalence between what or who 'It' is. I.e. do “I” care if “it” hurts, as a thing outside “I”, or is the assimilation between “I” and “it” what hurts? 1a) The “l” is formed by a geisha whose fabric is made from photoghraphs by the Hubble Space Telescope. 1b) The dot over the “i” is an eye – placed in the middle of the image. The eye simulates the allegory of the image that perceives and is formed by text from Hegel’s Introduction to The Phenomenology of Spirit – itself an condenced summary of the totality of the Phenomenology. The performance is based on a contradiction between acting and existing (without context), and this would confirm the nature of metaphors when embodying its own reality. The tension between the metaphor and the phenomena is complicated by its attempt to illustrate its own principle. 3) Additional objects: Table, two chairs, shelf & plant.